As I have said before, investigation, to me, means "eating (like a) local" [OK, like fetch, I will stop trying to 'make that happen'] and asking around for the best restaurants or "off the beaten path" places to visit. This led me to Torchy's Tacos, and we all know how great that was (Green Chili Pork Tacos, I miss you already), as well as my entree at Trudy's (despite making a big scene of asking the table next to me what they were eating...so worth it). On one of my days alone exploring the city (silly friend who has a job...who does she think she is? ), I stumbled upon a restaurant/take-out spot called Portabla, simply because I had been looking for a raw food restaurant I'd heard about, couldn't find it, and my stomach would allow me to wait for lunch no longer. Being intrigued by the cute patio, and mod signage, as well as it's claim of "quality food" (and, being alone, having no one to answer to should it not be a successful investigation), I parked and went inside. I had no idea that I was about to have one of my favorite meals in Austin! (I should have known it would be amazing when they proffered free samples of soup that it would be great. I love when people are friendly enough to share and believe in their product enough that one taste will make you want to order a whole bowl.) Because of my obnoxious curiosity (as seen in my leaning over the counter into the kitchen), I spotted a gazpacho not on the menu, and, as the day was incredibly warm and sunny, I knew I must have it. For my 1/2 sandwich (I cannot resist a soup + 1/2 sandwich deal), I debated between a Turkey/Bacon/Avocado creation, and the chicken salad, which was displayed in the glass case with other prepared entrees. Since I ALWAYS get the "bacon + avocado" whatever (Seriously, show me bacon and avocado together and I.am.so.there. Throw in tomato and I will hurry. ), and the chicken salad looked so amazing to me, I went with that. The gazpacho was seriously delicious. I have a go-to recipe of my aunt's (that is actually the South Beach Gazpacho recipe), but the Portabla gazpacho was super chunky, and, just like with guacamole, I often prefer a dish with a lot of hearty, chunky texture. There was not a lot of garlic or onion (I once made Ina Garten's Greek Gazpacho and had garlic on my breath for days...awesome upon first bite, but not awesome three days later) and TONS of basil. Also, they served it with ice cubes in it. GENIUS! Why had I never thought of that before. They were small enough chips not to water it down, but kept it perfectly chilled despite the sun. I was SO in love with the chicken salad. It was perhaps one of the best chicken salads I've ever eaten. Normally, I don't get mayo-based salads (not because I don't like mayo when used appropriately, but I often feel like too much is used, which masks the flavor of the ingredients and you can't taste anything....also, fat and calories are no joke---this coming from the girl who always orders the bacon and avocado, I know...) very often, but this was perfectly dressed...just enough mayo to hold it together, but I could really taste everything in it, including the toasted slivered almonds, which were a revelation. I always think of chicken salad with walnuts (or even pecans) but I have never had it with almonds, and the flavor was awesome. So where am I going with all of this? Well, not only did this investigation prove to be an incredible new food discovery, it also provided me with some excellent inspiration. In the glass case with the prepared foods, there was a Garbanzo Bean Succotash that looked amazing, but I didn't order it. Instead, I pulled out a piece of paper and scribbled down everything I thought was in it, and then used it as inspiration for a side dish on my last night in Austin. ...as well as a Mango Avocado 'salsa' inspired by the Ahi Tuna Tartare at Roaring Fork, as well as an episode of Giada at Home that Shannon had seen. I experimented with my Portabla-influenced Garbanzo Bean Succotash. Dinner was, all in all, incredible! 1. 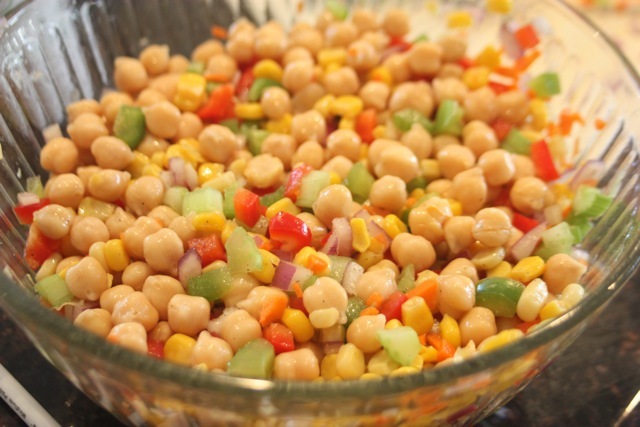 Combine all succotash ingredients in a large serving bowl. 2. In a separate bowl, whisk together the dressing. 3. Pour dressing over succotash and stir to coat.